The actual eating requirement for the Challenge will begin on the 3rd of November. November being a long month with 5 weekends, we thought we would start it here to try and get better compliance and participation. That will give you this upcoming weekend to get some meals organised for the upcoming week! Monday the 3rd will also be the day we take the before measurements and weigh in. The final day of the challenge will be Monday the 1st of December, we will do the measurements and weighing again. The before and after workouts will be done on the same days before and after to hopefully keep the data as accurate as possible. Workout 1: SXF Baseline, this workout will be done on Saturday the 1st of November, and retested on Saturday the 29th of November. Workout 2: 1x Max Strict Pull Up attempt + a 2K Run will be done initially on the 3rd of November and retested on the 1st of December. If you can’t make these days, let our trainers know and we will try to be as accommodating as possible and fit these workouts in another time. Feel free to use open gym to do these also if you can’t do it within a class. The entry into the challenge is $20 which includes before and after measurements, body fat readings and your Paleo challenge Log book where you can record all of this down, as well as take a food diary from day to day. You will also have access to the SXF Paleo Challenge Facebook page where you get interaction with other people in the challenge and you can share experiences, tips and advice. A big change we would like to see this time is don’t be afraid mid-way to ask trainers to take a look over your book and get some advice on your day to day eating. There may be some little modifications you can do to maximise your results along with assisting with compliance and energy levels. We have a special offer right now that bundles all four of our books – including our Meal Planning Guide – with a Science Lab membership. This also sets you up for our ETP Live Challenge that started on October 1st but you have until the 15th to submit your assessment. For more info, click the button below! In recent years, while the rest of the world continued to live in fear of fat, the fitness community totally embraced it. Carbohydrates became the target of our frustrations; we blamed them for making us fat, compromising our immune function, keeping us inflamed, and generally ruining our lives. We’ve learned our lesson now and carbs have had their reputation restored. It’s really about time, considering the role that carbohydrates play in the performance of nearly every sport. NOTE: This article discusses a lot of theory regarding physiology. It’s important to understand that because an interpretation of the way things work on a micro level may not always be accurate as research evolves, and it may not make that much of a difference in the great scheme of things. Still, if you’re already doing everything right and you’re looking for a way to tweak things to get an extra few percent-worth of muscle growth, fat loss, or performance, this is the article for you. What’s wrong with using fruit as a performance carb then? First of all, from the top down, there is usually quite a bit of fiber and water in fruit. It’s just not very energy-dense, so you need to eat a lot of it – far more than is feasible for most people – for it to replenish muscle glycogen quickly. That’s really your primary concern. Second, as the nomenclature implies, most fruits are chock-full of fructose, as well as sucrose (which is just a compound of glucose bonded to fructose) as well as glucose. As far as performance is concerned, fructose and sucrose leave a bit to be desired. Fructose is not bad in moderation; it’s just an inefficient carbohydrate. After fructose has been digested, it’s absorbed into the bloodstream and merrily sent on its way to the liver. However, while glucose sort of passes through and heads out to be utilized by other tissues by way of glycolysis, fructose metabolizes through its own unique pathway (fructolysis). It kind of hangs around and turns into pyruvate, then into glucose which is used to replenish liver glycogen storage. These stores are accessed to create glucose for other tissues during times of low blood sugar and stress, when plasma concentrations of glucocorticoids (like cortisol) are high. As far as performance goes, it’s nowhere near as fast as simply storing glucose as readily-available glycogen within skeletal muscle. The second issue here is that once liver glycogen is full, the rest of the fructose you ingest is promptly metabolized into triglycerides; consuming more than 50-75g a day (200-300 calories) is a surefire way to store body fat. This is especially true for women, who typically express a lower capacity to oxidize carbohydrate during intense exercise than men (although they do burn more fat). The caveat here? Well, to store any body fat at all, you have to be in a calorie surplus! If you train hard 5-6x a week, your liver will hardly have an opportunity to fully replenish glycogen stores. As valuable source of vitamins, minerals and fiber, fruits have definitely got their place in a balanced approach to nutrition. Furthermore, you’d have to eat a lot of fruit every day to reach that kind of fructose intake. As I mentioned in the first paragraph of this section, you’d also have to eat a lot (and I mean a lot) of fruit to satisfy your carbohydrate/calorie requirements after training; it’s just not optimal (or in some cases, feasible) to rely upon fruit as an energy source. Thankfully, there are other natural sources of carbohydrate available that are positively brimming with glucose as well as important micronutrients. Starches are an Athlete’s Best Friend? For some of us, it is challenging enough just to try to eat a healthy, balanced diet on a consistent basis. But what happens when we are eating the best we can and still are not reaping the full benefits, either in our daily lives or at the box? The answer may lie within… literally inside our stomachs. Dr. Tim Gerstmar of Aspire Natural Health breaks down what digestive enzymes are and why we should care about them. That makes sense. Now what would prevent your own digestive enzymes from working properly? Low-grade inflammation in the digestive tract (which can be caused by “food allergies,” intestinal permeability, dysbiosis, parasitic infection, etc.) can lead to deficiencies in digestive enzymes. Read the rest of this great primer on digestive enzymes here. Does This Have Anything to Do with Heartburn? Digestive enzymes help us actually absorb the nutrients in the food we eat. Check. But if digestive enzymes are doing their job, then why would anyone have to experience hearburn? when someone suffers from a bout of heartburn, acid in the stomach essentially rises into the esophagus following a spontaneous lapse of the lower esophageal sphincter. Although the stomach lining can inherently withstand the caustic digestive acid, the esophagus has no such protection. So what would cause stomach acid to rise? When we eat a high carbohydrate diet, our digestive systems can become overloaded with their breakdown. (Remember, of course, that our systems aren’t evolutionarily designed to consistently handle the common 250-350 grams of carbs per day). The malabsorption of carbohydrates in the small intestine (the seat of many digestive ills) can result in a damaging overgrowth of bacteria. As anyone who’s suffered from digestive bloating knows, gas is created in the process and can be excessive when something is awry. According to Robillard’s theory, the gas “pressurizes the upper digestive system,” which sets in motion the reflux mechanism. Robillard, a long-term GERD sufferer himself, reports being fully cured by adopting a low glycemic diet. For a more comprehensive look at solutions to this condition, read the full article here. - 3% of your bodyweight + 1L per hour of exercise of water per day. Sleep is a contributing score to your Paleo challenge points system, but it's a lot more important than gaining a few extra points. From a performance side - you can't recover as efficiently, and therefore perform again well. Testosterone levels will be down, and cortisol levels will be effected. Cortisol is a hormone that controls metabolism, immune function, blood pressure levels and inflammation control, among others. All crucial for both fat loss and performance. + Live like a caveman, when its get's dark go to sleep, wake up when it starts getting light. (An efficient sleeping cycle should wake you up at the same time every day). If your looking for some greater depth into potential sleeping problems/solutions, this article has some ideas. Be careful, that extra work your doing may be doing more harm then help. So if your serious about your results, improve your basics first and everything else will fall into place. Instead of watching another Simpson's re-run, get to bed (unless it's the Monorail episode). Jenna, a member at SXF Nedlands and also a writer has kindly provided us which a pretty comprehensive Paleo Resource. This includes a 'What is and why Paleo' intro, food prepping information and also some great recipes that have been tried and tested by herself. Fish Oil (or Omega 3) Supplementation, why and how much? Fish Oil is one of the few supplements with evidence behind proven and significant benefits. When you select a Fish Oil supplement, make sure you know what your looking for. Total mg doesn't tell the story, your looking for the total EPA & DHA content. Generally the higher ratio of DHA to EPA signifies the greater quality. Pure Pharma is up to 10 times times denser than your standard pharmacy Omega 3 supplement. Which means your don't need to take as many. (Taking 5 big caps per meal isn't fun). Your fish oil servings can be dictated by your own personal needs. If your body stores a lot of fat, (Omega 6) you want a higher serving of Omega 3 to even out this balance and help your body process this stored fat. If your activity level is higher than average you also need a higher serving. These categories would be suited towards the 3 caps a day. If your take your fish oil regularly, are quite lean and also get some good Omega 3 servings within your diet, you could start to decrease your daily servings. Flaxseed Oil instead? Flaxseed is an inefficient source of Omega 3, it comes in the form of a short chain Omega 3, which to be utilised as effectively needs to be digested (generally by something else) then consumed again. Pure Pharma not only being of the highest quality and purity, supports CrossFit and CrossFit athletes. If your goal is aesthetic, performance or assisting functions such as brain and joint health, a Fish Oil supplement is a great ally. Whole 9 These guys run regular challenges and are great for trying to adapt Paleo as a lifestyle. Paleo Challenge FAQ, what do you want to know? Due to the Paleo Challenge being held between 2 gyms, in the middle of the week and having a lot of people participating in the challenge having done it before - we are going to switch things up little. This time we are inviting everyone to email in with any questions at all they may have in regard to all things Paleo and the challenge. Please feel confident to ask any questions no matter how silly you think it may be, generally these are the same questions many people are all wondering about. We won't publish who asked each question. Email all questions through to jason@southernxfit.com and we will do our best to answer them all and publish the answers for everyone to see. Email in your question as soon as possible as we want to have the FAQs posted up by the start of the challenge. Here are some specific details regarding how the challenge will run and some new and improved changes. The challenge will start Thursday the 1st of May. That will be the day you start eating Paleo. The Challenge will end Friday the 30th of May. The workouts will be on the day before and first day of the challenge. The day that we require people to get their measurements done, weighed, fat percentage and photos taken will be the 1st and the 30th. After all our classes both Willeton and Nedlands will be having a brief Phat (Paleo chat) to answer any questions for new Pallengers (Paleo Challengers) or people with additional questions. The workouts will be re done on Thursday the 29th and Friday the 30th of May. Thursday evening or Friday morning will be the times to redo your measurements and photos. The entry into the challenge is $25 which includes a before and after measurements, photos and body fat readings. You get a booklet with detailed information about the science and tips for eating Paleo. 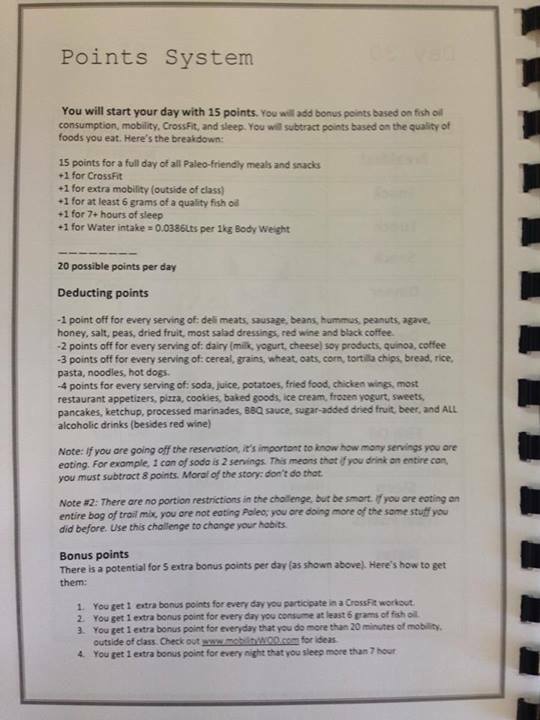 This booklet also doubles for a food diary which is required for the points system. Also some additional Paleo information material and before and after photos taken. You will also be given access to a private Facebook group where you can ask questions, get motivation and grieve over missing coffee. Only participating Pallengers will be in the group. There will be 4 different prizes available for 4 different categories - Biggest transformation, performance award, points award and people's choice award. I have attached the points system. If you have any questions please comment below. May the Paleo be strong with you. By now hopefully we are on track and have a good understanding of what we can and can't eat. Experiment with stuff now, mix stuff together and throw in a few spices here and there. It is great to hear that everyone is doing some of there own research as well. Own your body and tell your mind/stomach that you don't need that chocolate or that sugar filled drink just as you have told your limbs to pick up that bar one more time or to punch out that last push up during a WOD. Compare what you are going through now to what you have gone through in a WOD or even life and ask yourself is it really that bad, is it really that hard or am I being a big sissy?